West Harling parish sits, as its name suggests, to the south-west of the substantial village of East Harling. The parish now is dominated by the working forest that surrounds the market town of Thetford and its environs. Never a thickly populated area, the parish now contains a handful of farm-houses and millions of trees! 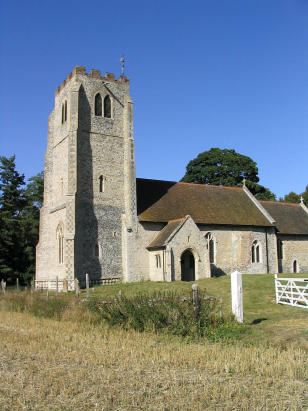 All Saints is a challenge for church finders, off the road system it is only approached by footpaths and tracks. Once the estate church for the West Harling Hall (demolished in the 1930s), the church sits in a delightful setting in a small clearing in the forest. 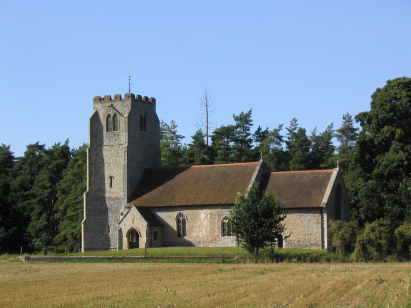 The church dates from the late 13th Century but was extensively modified and restored during the Victorian era. These records were transcribed from Microfilm MF598 in the collection of the Norfolk Record Office. Although this isn't in the recent batch of filming the images are of an acceptable standard and with good contrast throughout. As ever there are occasions where the entry can be tricky to decipher as a result of the hand-writing of the clerk. However in this small transcript there should be few such errors as the standard of hand-writing was consistently readable throughout most of the period.